Justine Bennett’s life isn’t the one you’d want for all eternity, which is exactly how long she’s going to have to live it. She’s the sword-wielding Guardian for the Goblet of Eternal Youth, which is currently masquerading as a shape-shifting espresso machine in a fancy New York City condo. 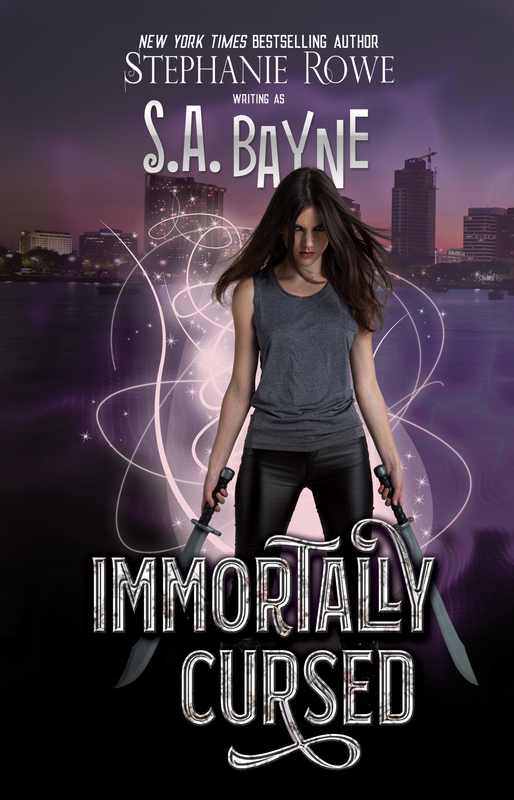 Being an immortal badass in the City that Never Sleeps sounds exciting, but Justine hasn’t gotten to behead anyone in centuries, the celibacy oath she took two hundred years ago is getting to her, and her dead mom is being hotly pursued by a lovesick Satan. But then Derek LaValle, a no-carb pretzel mogul cursed to die in a week, shows up at Justine’s door to behead her and steal the Goblet. If he fails, both he and his twin will succumb to the curse, so this handsome hunk of deliciousness is not going to let anything stop him. He’s charming, tempting-as-hell, and extremely determined, all the things that Justine needs to amp up her life. Unfortunately, if Justine makes even one mistake, her mom will end up as Satan’s love pancake, and her own soul will be destined for an eternity in the Chamber of Unspeakable Horrors. Derek, however, can’t afford to fail either, which means one of them needs to die. But when high-octane attraction blooms between them, killing each other no longer seems like a fantastic option. With such high stakes, they better figure it out fast, or Satan dating her mom will become the least of their worries.